Dangers of Online Drug Sales - Not All It's Cracked Up To Be! The International Business Times recently published a study by Dr. Mark Baron of the University of Lincoln, UK, who purchased drugs from several online dealer sites. Baron found that more than often that the legal drugs he was looking for and purchased did not contain the proper prescribed medication and included banned substances, fillers and other dangerous additives. Baron said, "Buyers should be aware of the medicinal products they buy online. There are variations to what websites retail online as they sometimes tend to keep the names same but may change the content of the tablets." Pittsburgh based Mobile Medical Corporation (MMC) is a certified Woman Business Enterprise that provides solution based substance abuse testing and on-site first-aid and medical services for the construction industry. MMC's corporate headquarters is in Pittsburgh, PA with regional offices in Cleveland, OH; Baltimore, MD; Astoria, NY; Paramus, NJ and Sacramento, CA. MMC’s Vice President, Marianne Karg presented “The Changing Face of Drug Testing” at the TAUC Leadership Conference in which she discussed how over the last five decades drug testing has evolved and changed due to testing methodologies, laws and legislature as well as the changes in drug use. Marianne explained how all of these factors effect implementing successful drug testing policies in the construction industry today. To request a speaking engagement or further information on the presentation please contact MMC! Some Ocala, Florida firefighters underwent random drug testing recently after morphine and phentenol were missing from paramedic drug kits on two of their firetrucks. Local firefighters union president and representative Robert Altman said that the fire chief ordered everyone on both of those trucks that day get drug tested. A southeastern Michigan nuclear power plant operator recently failed his random drug test and was suspended for at least 14 days under federal rules for nuclear plants. Federal rules require nuclear plant workers to be tested randomly for drugs and alcohol. Nuclear Regulatory Commission (NRC) spokeswoman Viktoria Mitlyng hinted that the owner - DTE Energy will decide whether to fire the employee or refer him to a program for substance abuse treatment and evaluation. A reactor employee who fails a drug test twice will have access to any nuclear plant revoked for at least five years. 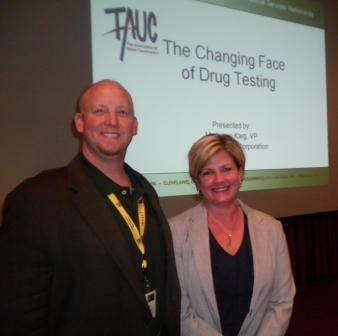 Substance Abuse Testing Protects Lives! Join the Pittsburgh Business Times, UPMC Health Plan, Mobile Medical Corporation and the YMCA of Greater Pittsburgh as we honor companies with the best employee health and wellness programs in our region. Winners of the 2011 Healthiest Employers in Western Pennsylvania were selected as a result of a survey of their corporate efforts to increase the wellness of their employees. All of the companies listed below are winners of this year's program. We'll be offering special honors to the five companies that led category groups based on company size. Six chemicals used to make "bath salts," a designer drug linked to scattered reports of violence and at least one murder in New Jersey, have been added to the state’s list of banned substances.